Stocks soared on Friday after the Fed backpedaled and adopted a dovish stance. Interestingly, that came on the same day that the December jobs reported easily blew away estimates. Clearly, the Fed is more concerned with asset prices (stocks, bonds, commodities, and real estate), than other economic data. But that is not necessarily a bad thing. After all, was said and done it was another volatile week on Wall Street but stocks managed to end higher which is a near-term bullish sign. The market is bouncing from deeply oversold levels and remains way overdue to bounce. 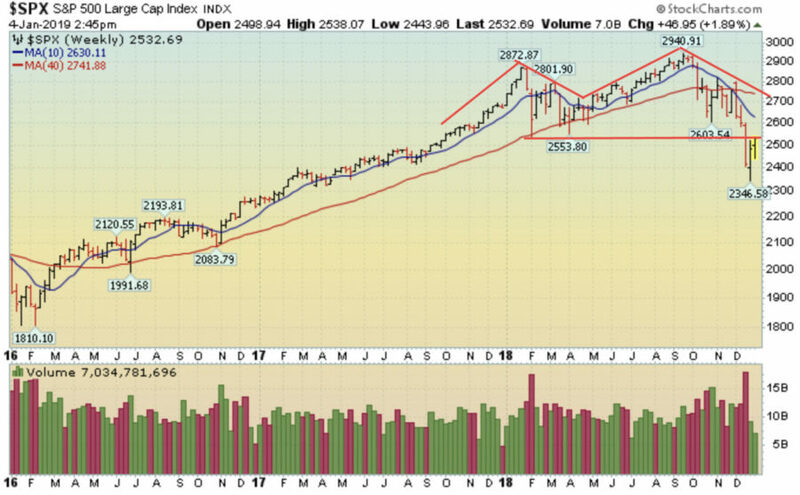 The next level of support to watch are December’s low while the next level of resistance is the 50 day moving average line. Remember, in healthy bull markets, we do not normally see 700-1000 point daily swings in the day. But that does happen in bear markets. We are entering earnings season, so keep that in mind over the next few weeks. Stocks rallied 200 points on Monday on the last trading day of 2018. Stocks fell in 2018 and logged their worst year since 2008. For the year, the Dow Jones Industrial Average fell 4.16%, the S&P 500 fell 4.98%, the Nasdaq Composite fell 4.49%, and the small-cap Russell 2000 fell 10.06%. It is important to note that they are all down near 20% from their record high set in late 2018 and the longest bull market in history ended in December 2018. Stocks were closed on Tuesday for the holiday. Stocks opened 400 points lower on Wednesday but turned higher as buyers showed up shortly after the open. Stocks opened lower after The New York Times reported that U.S. Trade Representative Robert Lighthizer has told friends and associates he wants to prevent President Donald Trump from accepting “empty promises” from China. The report also said that Mr. Lighthizer has warned Trump that additional tariffs may be needed to get meaningful concessions from the Chinese. In other news, China said its manufacturing index fell to 49.7 from 50.2 in November. That was the latest piece of weaker than expected economic data from China. After the bell, Apple slashed its outlook and said it expects to sell fewer phones and watches due to sagging demand.